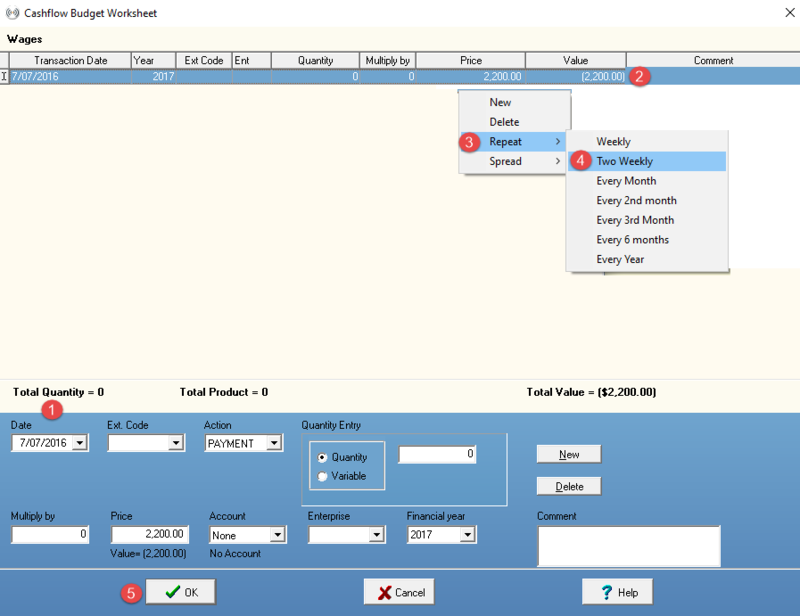 Use this tool for repeat payments like a lease, hire purchase, wage or rates payment while in a cashflow cell or worksheet. Enter the amount into the month you want the planned item to start in. Right click your mouse over the amount and select Repeat. Choose the frequency of the planned item. Highlight the cell displaying the amount you want to repeat. Hold down Shift + 'frequency of repetition'. For example, to enter your quarterly council or regional rates, hold down Shift + 3. This is useful for repeating wages, where an extra week in some months can result in an extra pay period (see below). Open the worksheet and enter the budget information as required. Right click on the budget item line. Click OK to close the worksheet.